The use of PET (Polyethylene Terephthalate) results in lower energy consumption during transport. Though the main materials used for production of PET originate from petroleum products, the effect of PET on the environment is much more favourable compared to glass, aluminium or other plastic compounds. This is due to the light weight and strength of PET: transport of products in light weight packages requires less fuel compared to many other materials. PET is a 100% recyclable material. The first PET bottle was recycled in 1977. Today the used material is collected and recycled to into a raw material for new products suitable for food, drink and personal hygiene purposes. The recycled PET is also used for production of mats, clothes, car parts, construction materials and package tapes. 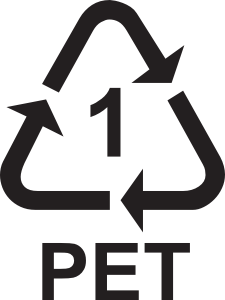 Chemically reprocessed PET converts to aromatic polyester polyol – the initial raw material of PET. PET is the most recyclable plastic & supports the maintenance of ecological balance. The very strict inspection procedures in washing and cleaning plants are designed to detect and eliminate any suspect bottles. Optical detectors and sophisticated electronic ‘sniffers’, in addition to manual inspection, ensure that these bottles are eliminated; such devices are used before and after washing. Contaminated bottles are not known to have passed through the extremely rigorous inspection systems. This is a frequent question that is almost impossible to answer. When looking at environmental criteria – unless each effect is categorised, classified, and ranked in order of societal importance – a clear answer cannot be given. For example, which is the most important – reduction of global warming gases, fossil fuel depletion rates, consumption of water, emissions to water courses, air emissions, eutrophication of waterways, reduction of ozone depleting gases, or other parameters?